Interior view of Cactus House showing plantings. 3. Cactus House (old house just before moving to conservatory constucted in 1912). Cactus House (old house just before moving to conservatory constucted in 1912). 1- 2.75x4 in. print. 4. Cactus House (old house just before moving to conservatory constructed in 1912). 5. Cactus House - North side looking east (1890s greenhouse). 6. View of the Old Cactus House, 1914. 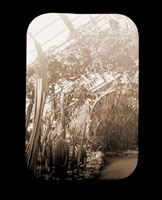 View of the Old Cactus House, 1914. Mounted with PHO 2006-0952. Lily Pond south of Linnaean House. Domed 1897 greenhouse addition and cactus house in background. Pereskia aculeata in cactus house.